A. In the minds of many, the only alternative to democracy is dictatorship. B. Tullock’s Question - “What’s so bad about dictatorship anyway?” – highlights the fact that public choice economists have spent little energy analyzing history’s typical form of government. C. Simplest approach: Dictatorship is equivalent to democracy with a single - and perfectly decisive - voter. E. Thus, we should expect dictators to be highly self-interested, but more interested in rationally assessing policies' actual consequences. F. Will this lead to bad consequences for the dictators’ subjects? According to McGuire and Olson’s “stationary bandit model,” not necessarily. As long as the dictator knows that he will be around for a long time, it is in his rational self-interest to encourage/allow economic development – to take a smaller slice of the pie in order to make it grow faster. 1. Alternate perspective: Stationary bandits go to the maximum of the long-run Laffer curve instead of the short-run or instantaneous Laffer curve. G. Remember the Tiebout model? It is basically a model of dictatorship constrained by mobile capital and labor, and under standard assumptions it yields perfectly competitive results. 1. If the rulers of Tiebout governments were really dictators, then my arguments about non-profit competition would no longer apply. H. In the real world, dictators often respond to the mobility of capital and labor by trying to make them less mobile. The Berlin Wall is the most notorious – but not the most horrific – example. 1. However, dictators do treat mobile resources better. East Germany rarely forced tourists to become citizens, and Communist governments rarely defaulted on their sovereign debt. I. Many dictators go further by making war to get more resources under their control. Why grow when you can conquer? J. Another reason for dictators to stifle growth: Growth leads to contact with the outside world and/or free thought, which tends to undermine the dictator’s authority. A. Very few dictatorships actually fit the “one decisive voter” model, though modern totalitarian regimes – like Stalin’s USSR, the Kims’ North Korea, and the last years of Hitler’s Germany – come close. B. Almost all dictatorships throughout history have instead been “authoritarian.” The dictator has a lot of say, but at least de facto, so do many other actors. The dictator ignores them at his own risk; if he goes over the line, he risks a coup. C. Most people add that at some point, an abusive dictator would provoke popular resistance. E. Tullock, in contrast, argues that collective action problems make popular revolutions virtually impossible. F. Most political observers believe in the existence of revolutions, so for them Tullock’s argument creates a “paradox of revolution” – revolutions seem impossible in theory, yet they occur. G. For Tullock, however, “popular” revolutions are thinly disguised battles between rival elites. The competing sides solve their collective action problems with selective incentives – better ration cards, promises of post-revolutionary jobs, etc. H. Trotsky’s on Tullock’s side: "An army cannot be built without reprisals. Masses of men cannot be led to death unless the army command has the death penalty in its arsenal. So long as those malicious tailless apes that are so proud of their technical achievements - the animals that we call men - will build armies and wage wars, the command will always be obliged to place the soldiers between the possible death in the front and the probable one in the rear." I. Watered down version of Tullock: Revolutionary movements require true believers to get off the ground, but further growth requires selective incentives. III. The Sociopathic Bandit Model? A. A major complication for economic models of dictatorship: Being dictator effectively makes someone extraordinarily wealthy. The resources of an entire nation are theirs to command. B. Due to their extreme wealth, they may consume a lot of altruism, expressive considerations, and/or irrationality despite their high price. 1. Mass murder of seemingly useful subjects. 2. Awe-inspiring parades, monuments, palaces, etc. 4. And… voluntary reduction to figurehead status! 1. Tullock’s explanation: The selective pressure for power-hunger is much weaker in hereditary dictatorships. E. On balance, then, it is hard to make definite statements about the selfishness, instrumentalism, or rationality of dictatorial versus democratic policy. It’s got to be studied empirically. 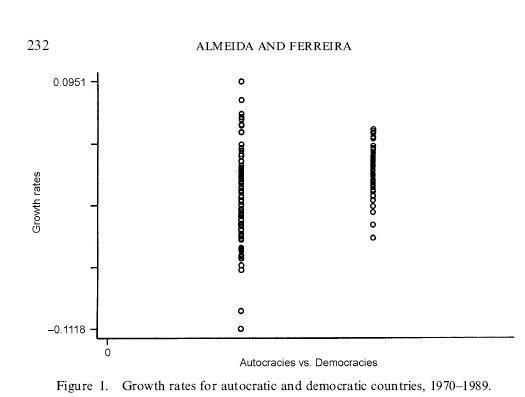 H. Interesting finding #2: When a dictator accidentally dies, growth rates persistently change. When a democratic leader accidentally dies, in contrast, they don’t. B. Since #5 is equivalent to socialism in the traditional sense of the word, many socialists object to this criterion. But it is hard to rebut Trotsky’s explanation: "In a country where the sole employer is the State, opposition means death by slow starvation. The old principle: who does not work shall not eat, has been replaced by a new one: who does not obey shall not eat." C. One cheer for democracy: Totalitarianism has almost never been established democratically. (Semi-convincing counter-example: Hitler’s Germany). It arises through civil war (USSR, China, etc.) or conquest (Eastern Europe, North Korea). D. A few analytical narratives on the rise of totalitarianism. E. A few analytical narratives on the implosion of totalitarianism. 1. Economic calculation (comparing the cost of different ways of doing the same thing) requires prices. 2. Prices require some kind of market (not necessarily laissez-faire). 3. Under socialism, there is no market, therefore no prices, therefore no calculation. 4. Conclusion: Socialism is impossible. C. Many socialists replied that market socialism or faster computers would make socialism possible, but the rejoinders are obvious. D. My complaint: The argument is fine until the conclusion! The lack of economic calculation makes socialism more difficult, but difficult is not impossible. 1. Its biggest disasters – massive famines where millions died – were caused by bad incentives, not lack of calculation. 2. Socialist planners habitually ignored capitalist prices; they didn’t just preserve socialism by free riding on the price system of the non-socialist world. 3. When socialist societies wanted results, they used strong incentives and got results. See their secret police, border security, militaries, space programs, Olympic teams, and nuclear weapons. F. Also note: Incentive experiments in Soviet agriculture showed that it was possible to sharply raise output, but the experiments were ignored and their initiators punished. VI. Democratic Transitions: What Happens? 1. Strong populist back-lash against free-market policies – and election of ex-Communists (and even unrepentant Communists) – in the former Soviet bloc. 2. Chile kept most of Pinochet’s economic policies after he relinquished power. 3. Free elections in Palestine did not lead to dovish victory. B. However, there are many more plausible explanations than Mises’ story that dictators are fully constrained by the threat of revolution. C. The stationary bandit model. Stable dictators, like the median voter, benefit if their country has pro-growth policies. 1. Of course, this model isn’t very convincing if you think that both kinds of governments have deeply inefficient policies! D. Shared preferences. Especially in long-lasting dictatorships, the dictator and the median voter come from the same basic political culture and therefore have similar preferences. E. Status quo bias. To a large extent, dictatorships successfully brainwash their populations to think that what is, is a pretty good idea. 1. Fascinating result: Alesina and Fuchs-Schündeln (2005) find that East Germans are markedly more anti-market than West Germans, even controlling for income. Living under socialist tyranny doesn’t make people hate socialism.